It is a movement every rider who jumps or does top level dressage wants to achieve. It is also one of the toughest things to train a horse. It is… The Flying Change! The dictionary defines a flying change as a movement where the leading leg is changed in the air without breaking gait. This movement is used across the board from racing, to dressage, eventing, hunters, jumpers, reining, polo, and so on. Horses who perform this movement in competition use it to show collection, precision, balance, and obedience. It is important to note, a flying change should not be trained too early in your training. Your horse must have some basics before being asked to learn the change. If it is taught early in a horses training it becomes more of a “trick” than an actual movement. And subsequently some horses get “jazzed” or nervous when being trained to do a flying change. Tension and pulling make doing a change difficult. Training the change should be taken slowly and with patience as it is something when done well is similar to watching a fluid ballet dancer. Today we will explore some things your horse should master before he learns to perform the actual change. Then we will approach some techniques used to train the horse to do a correct change. What is a “correct” change? This is where the horse performs the flying change from back to front in one fluid movement. It means his hind legs are the first part of his body to make the change to the new lead and the horse changes his bend from one direction to another. When the movement is performed front to back or in a “broken” movement, meaning one set of legs changes, the horse takes a step, and then changes the other set it can be scored as “late”. This change is incorrect, and will be penalized in the show ring. It can mean many things from the horse being lazy, to a potential soundness issue, to an ill-trained change, or can even be confusion in cue from rider to horse. Before we venture into the whys and wherefores of teaching the change, there are a few things you should already have trained your horse. Your horse should have three basic gaits; the walk, trot, and canter. 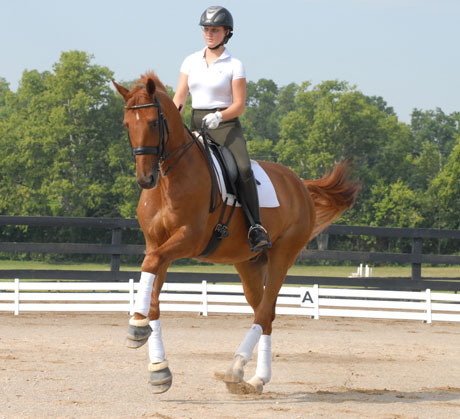 Next, your horse should be proficient at performing a canter-walk-canter transition. This means your horse is good at the aides and waits for cues from his rider. Another movement your horse should be proficient at is the counter-canter. The counter-canter is basically defined as cantering on the incorrect lead on purpose. Most changes are taught from the counter-canter. This movement allows the horse to remain straight and to keep their balance as they shift from one canter lead to the other. Another good pre-change tool to teach your horse is basic lateral movements. A horse who moves laterally (either in a leg-yield, turn on the forehand or haunches) will better understand the shifts in weight from his rider when the change is approached. If your horse has been started correctly then teaching the change should be fairly simple. Every trainer has a different beginning for teaching the change and many trainers will work with a horse over a number of days to achieve a final result. One way to go about it is to use a pole on the ground that can also become a cavalleti and be raised off the ground to help your horse jump. (Side note: it is best if your horse can trot and canter over a pole on the ground without getting too worked up) Start by laying the pole on the diagonal (or one on each diagonal) across the arena. 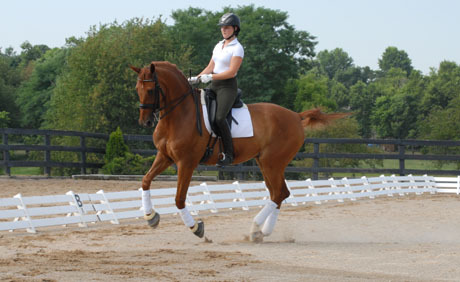 After a good warm up, ask the horse to canter on a large figure eight around the arena. Without crossing the pole the first couple of times, work on the simple change. If your horse takes 5-7 trot steps the first time, then try to get 4 the next time, 3 the following, and so on until your horse can handle just a simple single trot step before they pick up the other lead. Once they have mastered this, it’s time to add in the pole. Do the same exercise as before, only this time using the pole as the point at which you do the trot step. If you horse masters this, then it is time to start trying to get the change over the pole. Now that you are going to try the change, it is important to have your timing down. If you ask too early or too late you are likely to get the “late” change or only a partial change. Most of the time it results in the horse performing the change with their front legs because the rider throws their body to the new direction essentially upsetting the horses balance. Asking for the change should come directly from the seat and legs of the rider. The question now is when to ask for the change. Using the pole to get the change, the horse should be asked for the change as he “takes off” over the pole. The rider needs to have a pre-determined plan of action for what happens next. If the horse is correct it is important to let them know they have performed correctly by patting or voice-praising them. If they are incorrect it is best to bring them back to the trot or walk, and then start over again. It is not usually for lack of trying that a horse is incorrect. If the issue continues, raising the pole could help the horse with placement of his feet. 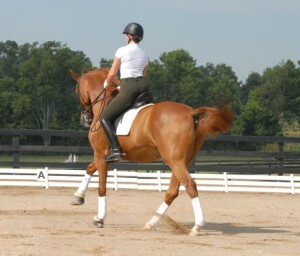 A raised pole allows the horse to get his shoulders and hip lifted more to make the change easier. Once your horse has mastered the change both directions over the pole it is now time to try the change without the help of a pole (or raised cavalleti). If your horse is successful a few times it is often considered wise to let them be finished with that exercise for the day. Once they have the flying change trained, most horses will not need to be schooled repetitively. It is amazing the things horses can learn when they are asked. Some horses thrive on new and interesting abilities. The flying change is not an easy ability to teach and should be approached with patience and a willingness for flexibility in the horses’ learning curve. Now, off to see what you can teach your horse to do!